Vietnam’s Ministry Labour, Invalids and Social Affairs (MoLISA) and the TOA Institute, a Japanese general incorporated foundation, signed a memorandum of understanding on training cooperation in agriculture on July 27. Under the pact, Vietnamese trainees in the agricultural sector will see a greater chance to work in Japan’s Hokkaido. Addressing the signing ceremony, MoLISA Deputy Minister Nguyen Thanh Hoa highlighted efforts made by the two governments have resulted in the increasing quantity and quality of Vietnamese trainees going to Japan to further their working experience. The newly-inked pact will stimulate the two sides’ cooperation in agro-forestry-fisheries, which is among the most prioritised sector of the MoLISA in terms of enhancing manpower quality, Hoa stated. TOA Director Takebe Tsutomu stressed that Japan has evaluated the Vietnamese trainees as industrious learners and hoped that the MoLISA will send more local experts and trainees to Japan in a wide range of fields beyond agriculture. On the sidelines of the event, Takebe Tsutomu said he has proposed some law amendments to facilitate the receiving of Vietnamese trainees in the agriculture field. 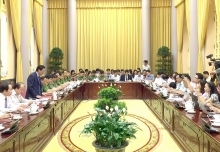 Previously, MoLISA Deputy Minister Nguyen Thanh Hoa held talks with leaders of Okayama prefecture, the Japan International Training Cooperation Organisation , the Japanese Ministry of Health, Labour and Social Welfare, highlighting the requests for greater affiliation in receiving trainees and investment activities in Vietnam. Vietnam commits to providing trainees fulfilling requirements from Japanese partners, Hoa said./.